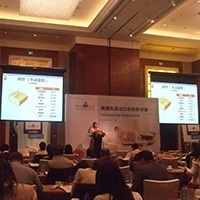 USDEC hosted seminars in Beijing (October 14) and Shanghai (October 16) with the theme of “New Horizons of U.S. Dairy Ingredients” reaching 110 participants, primarily R&D staff from local and multinational end-users. The seminars highlighted the United States’ expanding portfolio of attractive dairy ingredients with an emphasis on milk protein concentrates/isolates for health and wellness innovation as well as permeates as a bright prospect rising star ingredient given the cost-saving, flavor potentiating and sodium reduction benefits.